Who needs a copy editor? You do. You are here: Home / Journal / Who needs a copy editor? You do. Whether you are writing as an independent author or your goal is to be traditionally published, there’s at least one partner you need to help you get your work ready for prime time: a copy editor. Even though I was an English major and I have been a magazine editor for close to a decade, I would never trust my own eyes to edit my own writing. When you spend months working on a manuscript, writing, doing revisions, and rewriting, you are intimately familiar with your work. So intimate, in fact, that in spite of your best efforts, as you read you will inevitably gloss over a lot of what you have written—even when you’re trying to look at it closely. Since you always know what’s coming next, you will mentally insert words that may be missing and you will most definitely not catch all of the errors in syntax, punctuation, etc..
Fine, but unless that high school English teacher moonlights as an actual copy editor, don’t expect your manuscript to be as cleanly polished as it would be if you forked over the money to hire a professional. What exactly does a copy editor do? And if you’re fortunate enough to get a copy editor like Marcus, you’ll also get an advanced education about fiction writing as you work through the items that he flags in your manuscript. In The Smuggler’s Gambit, there were two substantial areas where Marcus gave me direction beyond grammar, spelling, and syntax. First, he read through the manuscript and asked me right off the bat why I was using flashbacks instead of writing the story in chronological order. I explained to him that an author friend of mine had been a beta-reader and said that in the earlier version of my manuscript, the first several chapters were a bore, and that I should cut them and work the pertinent facts in as flashbacks. Marcus evaluated the situation and ended up suggesting a brilliant solution that would allow me to put the novel back into chronological order—the way I had originally written it and wanted it—but without slowing the story down. His idea was a simple one, but it was brilliant. It would require a good deal of work on my part, like shifting things back around and rewriting a few scenes before the novel would be ready for a copy edit, but I was more than happy to do it. I knew his recommendation was spot-on and would help me produce something far better than I could have done without his professional expertise. I won’t call the manuscript I sent to Marcus a lump of coal. He’d tell you it was pretty clean, for the most part. After all, as I said earlier, I do have plenty of experience writing and editing. So let’s just say that it was like rough diamond. Here is one of the pages with several corrections from Marcus. The image above shows other examples of errors he caught: repetition, viewpoint changes, and in a handful of cases, areas where some more description might have been needed. Wherever he indicated “Viewpoint shift,” I knew what to do, because he had given me some clear examples in the margins earlier in the manuscript on how to address those issues. Marcus helped me shape and polish that manuscript it until shined. If you’re planning on querying agents, you don’t have to have a copy editor, but it will help your manuscript not immediately get rejected just because of mistakes that could have easily been fixed if you’d been willing to invest in the services of a professional. You don’t need to tell a prospective agent or publisher that your work has been copy edited. The clean manuscript will speak for itself. The advantage is that by making sure the draft you sent out is as professional as possible will ensure that any decision being made is based on the content of what you’ve written and not whether or not they got annoyed that you made stylistic or grammatical errors. Where do you find a copy editor? I found Marcus through the Editorial Freelancers Association. I simply did a search based on my genre—historical fiction—and he was one of the search results that came up. I went to his site and was very impressed with what I saw, so I contacted him via e-mail and asked him if he’d be available a couple of months later to copy edit my manuscript. 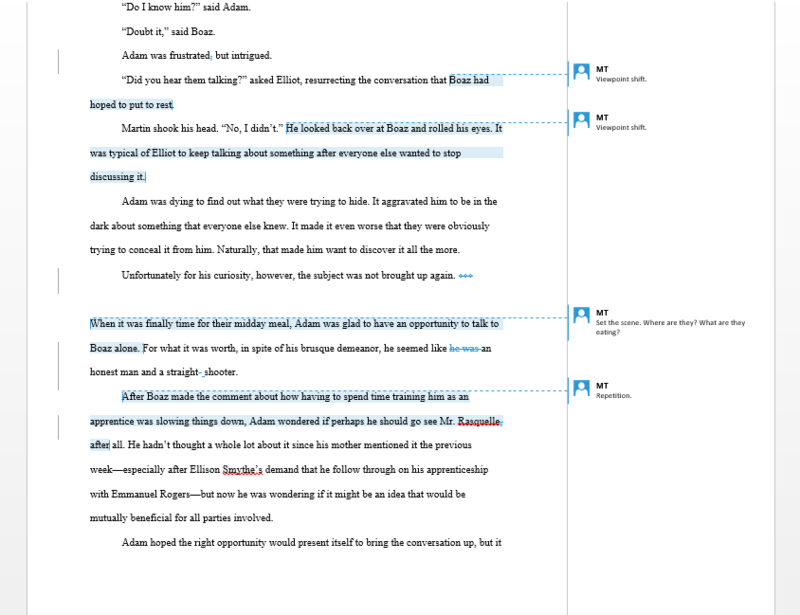 He said that he would and he told me to send him a sample of about 10 pages or so that he would copy edit for free—just to show me what I could expect from him as a copy editor. Please note: DO NOT hire a copy editor if they are not willing to do a sample edit for you. From what I understand, it is standard that copy editors do this, so if someone you’re interested in isn’t willing to do a free sample edit, you should take your business elsewhere. Think of it as an audition. You wouldn’t hire a band that you had never heard before to play for a party, right? So why would you hire a copy editor when you have no idea what kind of work they do. I will point out that while it is not typically recommended that writers in the United States hire copy editors in, say, England, and vice versa, I felt comfortable with Marcus as a copy editor because he frequently works with writers on both sides of the pond and is familiar with American style and spelling conventions. I also thought he would be able to add a special eye to detail to any language used in my novel that refers to the Crown or British government. Hi Sara. Thanks for introducing me to Marcus. I have written him with interest in having him copy edit a MS for me. You offer more valuable assistance to writers than anyone. Paul.